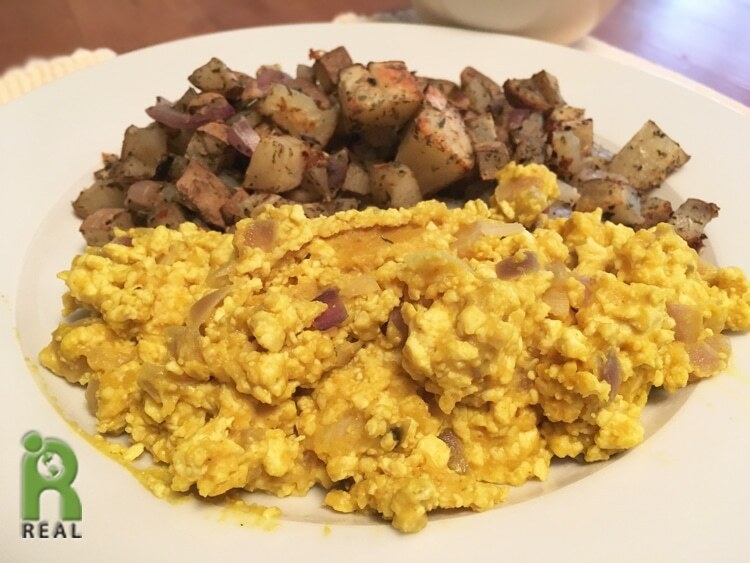 Here’s a new scramble recipe. I’m naming it after me! In a heavy frying pan or skillet, dry sauté the chopped onions for about ten minutes. If they start to stick add a couple of tablespoons of water. Add the mashed tofu and let cook for a few minutes, stirring occasionally. In a small bowl mix together the garbanzo bean flour, onion powder, turmeric and nutritional yeast. Add the water and beat with a fork until smooth. Mixture should have the consistency of heavy cream. If the batter is too thick, add a couple of tablespoons or more of water. Pour the garbanzo bean flour mixture in the pan and stir to incorporate. Continue to stir the scramble as it cooks and flour mixture dries, about 5 minutes.